Here’s a hilarious idea for a movie: let’s portray two lifeless characters who are competing for the same job! Can you believe I came up with that on my own? Wait – there’s more…what about if the job they are competing for is a manager of a small grocery store in some podunk town! Then to top it all off, these two characters do some immoral things to each other to get a leg-up on the inside track for the big job! Stop me when you’ve heard enough! I don’t know how writer Steve Conrad could put together a funnier premise, unless, of course, it wasn’t intended to be funny. Oh…my bad. Part of the failures of this film was figuring out where it fit in. In case it didn’t come through in my prior tone, there was nothing funny whatsoever about this film. Absolutely nothing. Anyone that refers to it as “dark comedy” is simply using that term as a crutch for a crap movie. A dark comedy usually has a hint of intelligence blended together with really clever writing and dialogue. This film had none of the above. So then was it intended to be a drama? Really? Isn’t it an important feature of dramas to have gripping characters that we care about? Well you won’t find any of that here. Instead it is drab characters in lame roles giving half-assed performances by mid-tier actors. 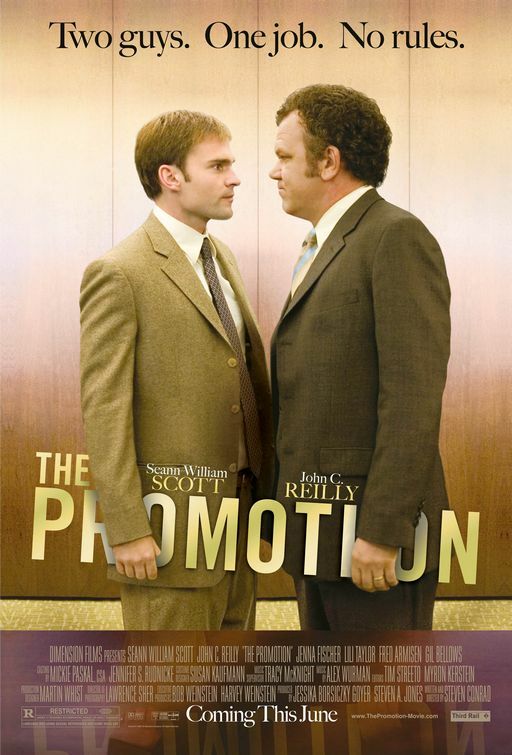 Seann William Scott plays Doug Stauber (an attempt at finding the most dull name ever created for a character…no offense to the Doug’s out there), an assistant manager with huge aspirations to become the head manager of a new supermarket location. He has to impress his boss (Fred Armisen) and the suits in corporate that he can handle the job. Except his biggest problem is that he gets angry comment cards with dirty language from the parking lot because a bunch of punk kids hang out there and harass his customers. Then, as if things couldn’t possibly get any worse for him (yuk-yuk), John C. Reilly shows up in the form of Richard Wehlner, a Canadian ex- druggie who still likes to light up a fattie at work once in a while and listen to self-help tapes. He also appears to have a heart of gold, but turns into a mean-spirited adversary after getting pegged by a frozen tater tot courtesy of Stauber. Seriously, you can’t make this stuff up. Jenna Fischer shows up as Doug’s wife, in a horrible attempt at her noteworthy character Pam from The Office, but is given no room to work. I guess we are supposed to find it humorous that she is a nurse or doctor, or whatever it is, as long as you get the point that it’s a more important job than Doug’s. That’s where the humor is supposed to be. Last but not least, don’t forget about the random guy that likes to hit Doug because the Teddy Grahams coupons are not honored anymore at his store. Yes, ladies and gentlemen, we have pure comedic genius here. I’d rather not waste anymore of my time writing about this poor excuse for a film. If you still decide to watch it, that’s on you. You have been forewarned. In other news, Johnny C. puts out another stink-bomb and Seann William Scott has yet to be mildly entertaining in anything not named American Pie. I think the jury is out on the Stiff-meister. Interesting Cameo Appearance: Joe Farina (aka the son of Law & Order’s Dennis Farina…that’s right – they couldn’t even get Farrina himself, they had to get his son who apparently is an actor too) as the Pepsi Representative. Richard: We’re all just out here trying to get some food… sometimes, we bump into each other. Board Executive: Was he just talking about jacking it right in front of customers?